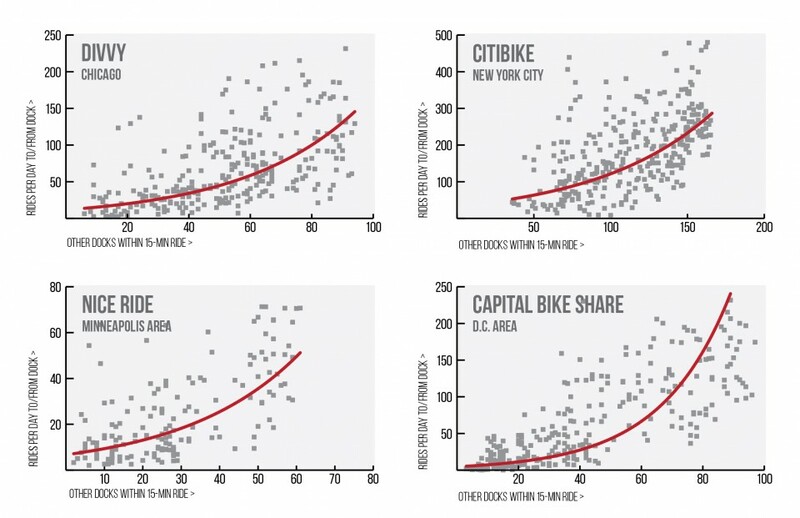 NEW YORK (April 28, 2015) — Bike share use increases exponentially with station density, according to a new NACTO analysis of U.S. bike share system data, released today. Systems that are designed with stations a five minute walk apart provide more convenient, reliable service and are used much more frequently than systems with more far-flung stations. To increase ridership among low-income populations, bike share systems must be designed to offer a meaningful transportation option. As cities seek to build successful, equitable bike share systems, NACTO finds that high station density – approximately 28 stations per square mile – and even station spacing is key. NACTO’s Walkable Station Spacing is Key to Successful, Equitable Bike Share makes the connection between station density, service quality and equity, and provides a data-driven analysis for system operators looking to expand the reach and utility of their bike share systems. Looking at ridership data from a variety of U.S. bike share systems, NACTO finds that the utility of a bike share system, as well as ridership, increase exponentially when stations are closer together. Data analyzed from bike share member surveys clearly shows that convenience is the reason why people use bike share and station placement must be guided by the distance people are willing to walk to find a bike. Equitable bike share requires close, even station spacing – a station every 1,000 feet – in order to create a convenient network of stations that allows people to make the trips they want to make. In an effort to serve a greater geographic area, however, many cities have lower station density and fewer stations overall in the low-income neighborhoods that their bike share systems serve. 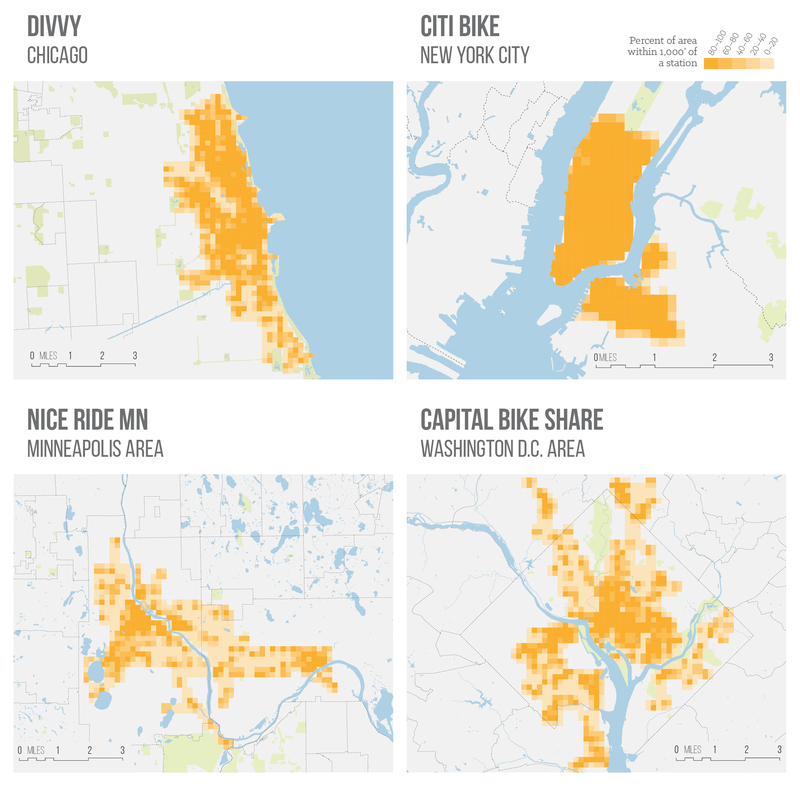 NACTO’s research shows that the “one in each neighborhood” station siting model does not advance equity, as it reduces service quality and ridership and makes bike share a less convenient transportation choice, especially for low-income residents. Cities can increase bike share use by ensuring that all neighborhoods in their program areas, regardless of income, are served by a large number of bike share stations, evenly spaced a short walking distance (no more than 5 minutes) apart. To help cities identify locations where infill stations are needed, NACTO’s Bike Share Program has developed a GIS model that measures system convenience. Cities interested in using the model can contact NACTO. NACTO’s research also highlights the importance of protected bike lanes in making bike share a real option for people of all cycling abilities. 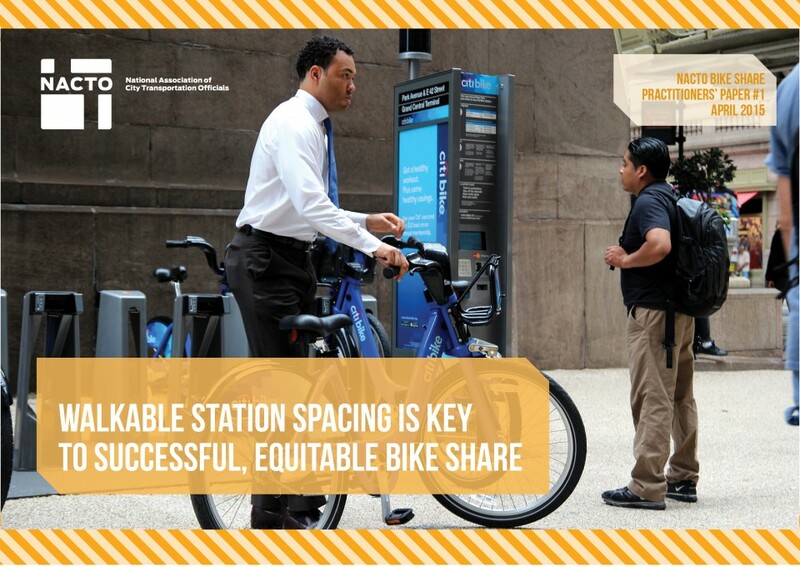 Walkable Station Spacing is Key to Successful, Equitable Bike Share is the first in NACTO’s Practitioners’ Papers series which identify best practices for cities introducing or expanding bike share systems. The papers specifically address strategies to increase the number of low-income people who use and benefit from bike share systems.